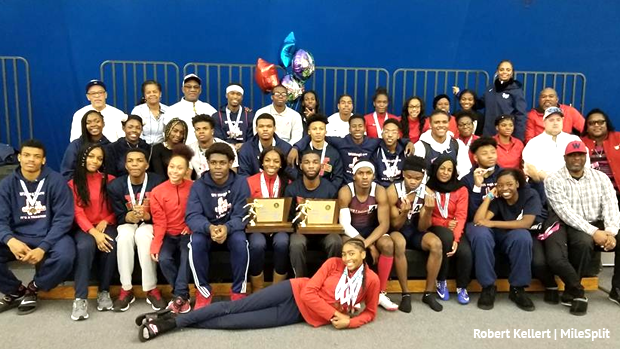 The Willingboro boys and girl swept the Group 1 team championship titles during Thursday's NJSIAA State Relays. The boys won their third straight State Relay Championship, the girls their first since 2010. Willingboro seems to have a habit of sweeping titles as well, both squads have won the same year four times including 2002, 2003, 2005, and now 2019. While the boys had this wrapped up before the final events even started the girls title came down to a dramatic finish with Collingswood. The Collingswood girls did what they had to and won the seeded heat of the 4x400m running 4:16.02 for 10 points. Unfortunately for Collingswood though the Willingboro girls, out of an earlier heat, already ran a 4:21.02 which was good enough to knock down some seeded heat teams and finish fourth overall. With that fourth place finish they score the four points needed to clinch and bring the championship home. The girls won one event, the shuttle hurdles relay with a time of 33.89. Elsewhere on the track they were third in the 4x200m, 1:51.49, fourth in the 4x400m, and fourth in the SMR, 4:33.81. One of their best performances wasn't even a gold medal one. Their high jump crew of Kenady Wilson and Tamia Welch Smith cleared a total height of 10-04, with Wilson's 5-06 second overall and Welch Smith's 4-10 fourth. This tied A.L. Johnson in height but ALJ won by jumps, both teams tied the Group 2 meet record of 10-04 set by Mater Dei back in 1982. On the boys side Willingboro won multiple events including the shuttle hurdle relay, 31.86, 4x400m, 3:33.94, high jump, 12-06, and shot put, 87-09.This was complimented by second place finishes in the 4x200m, pole vault, and SMR. Their shuttle hurdle relay made their way through some unexpected drama when their lane was interfered with by a rogue hurdle during the final heat of the event. They stepped up for a re-run and still won the event by a large margin. The boys high jump relay also had some record news but instead of tying they broke the record by two inches at 12-06, Kameron Smith at 6-04 and Nate Robertson 6-02. The previous record was a three-way tie at 12-04 between Palmyra, Pleasantville, and Westwood all set during the 1990s. Their winning shot put team including Deonte Allen at 46-02.75 and Emmanuel Lewis III 41-06.25. You can see Willingboro's full team performance right here in this results summary. Other highlight performances included wins by Camden in the boys 4x200m and SMR running 1:33.30 and 3:43.85. Camden's 4x200m set the Group 2 meet record held by Willingboro since 2017. The Pitman boys took gold in the 4x800m 8:31.22 and DMR 10:46.90. New Providence won the boys pole vault clearing 24-00 led by Cheney Price at 14-00 and Christopher Oh 10-00. The girls event wins were spread around more teams. We listed the Collingswood 4x400m win at 4:16.02 already, Malcolm X Shabazz took the 4x200m at 1:49.12, Highland Park the SMR 4:28.63, Shore Regional the 4x800m 10:10.87, Metuchen the DMR 13:04.71. In the field Audubon won the pole vault relay over 176-00 led by Sarah Parr at 10-00 and Madison Alexander 7-00, Haddon Heights won the shot put with 69-04.5 led by Cydney Thomas 42-04 and Kennisha Lewis 27-00.